Ideally, a checklist should be numbered -- unlike the one shown here! One of the simplest tools at a teacher's disposal is the humble checklist. 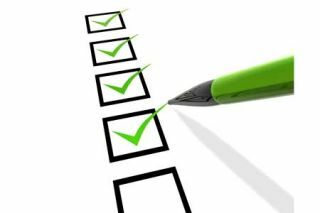 Checklists have been instrumental in saving lives in hospitals, averting disasters in planes and, less dramatically perhaps, ensured pain-free software installation in schools. The value of the checklist was brought to a wider audience by Atul Gawande in The Checklist Manifesto. However, they were a staple part of the Framework for ICT Support (FITS) scheme some years ago, in which those managing technical suport in schools were encouraged to use checklists to govern trouble-shooting, software installation and other processes.